Over the last few years of HGAT, one of the most popular questions asides from “are you fat?” (I’ll leave that to you to decide) and “what does BW stand for?” (I’ll only reveal that once someone has guessed it correctly) is “what are you?”. Of course, I’m not really sure exactly what you mean by that question and I will assume you are referring to my mysterious culture/nationality. To put it simply, I’m a British-born East-African. BW, on the other hand, is 1/2 Indian (his Dad) and 1/2 East African (his mum). However, according to him, he is 100% Indian, and he refuses to believe otherwise. Of course, this frustrates me to no end and I constantly have to remind him that our children will be 3/4 East African. I’ve now turned my attention in trying to make him appreciate his East African roots, and started to introduce traditional dishes into his diet. 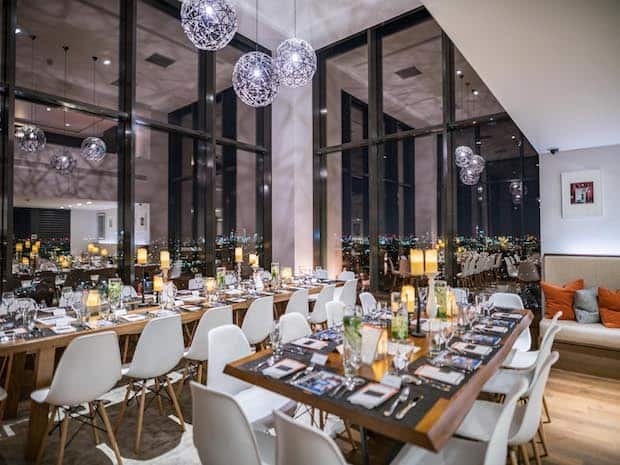 When I saw that MzuriKhana, an East-African catering company, were holding a supperclub with their proceeds going to the popular charity, Action Against Hunger (as part of The Great Get Together campaign), I quickly booked two seats and informed BW about it the night before. We arrived at Vantage Point in Archway, and were greeted with a beautiful view over London and a quick round of canapes and socialising, before being summoned for dinner. As usual, my photos are terrible due to lighting and forgetting my camera – sorry guys! A meat lover’s dream. 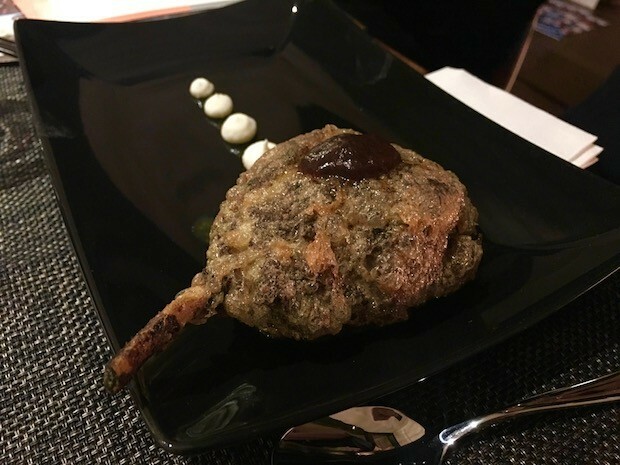 A lamb chop that had been covered in spicy minced lamb, dipped in a seasoned egg batter, and fried to achieve a lovely golden crisp. Biting in, the lollipop was deliciously soft with the lamb chop maintaining a lovely pink and tender centre, and the mince was so well flavoured that I tried to make this dish last as long as possible. A firm favourite of the table’s. 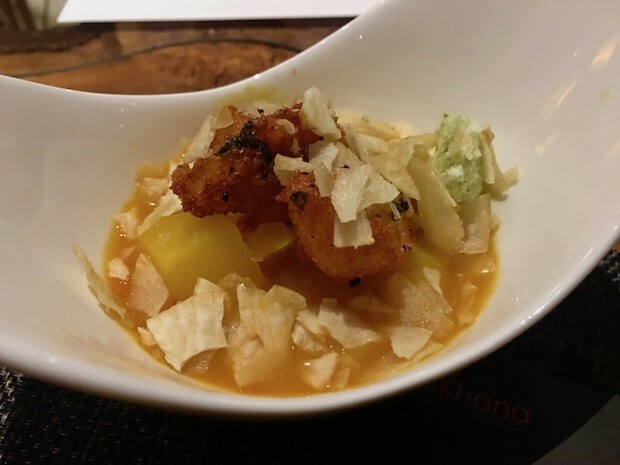 A mild chickpea and potato stew topped with crushed cassava crisps, and served with a couple of bhajis, tangy tamarind sauce, and a dollop of a spicy coconut chutney. A simple dish, but was done really well and made me crave seconds. 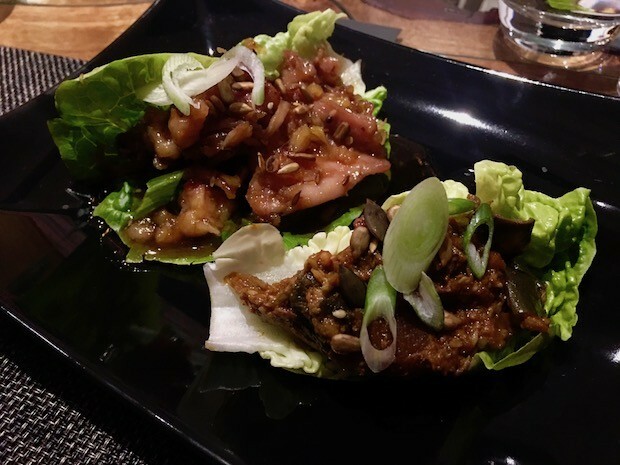 Keeping it light, the honey cumin chicken was served in a lettuce wrap, and served alongisde a second wrap containing curried aubergine. The flavours were great, especially the sweet and earthy cumin undertones. 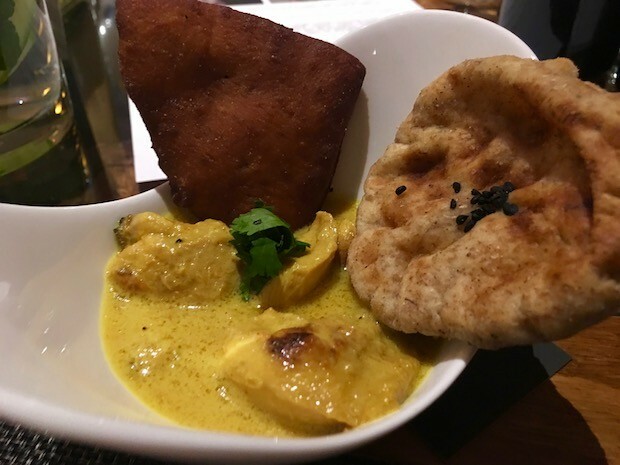 A coconut-based curry made using boneless and smoked chicken pieces, and served with a mini mandazi and naan – I’ve never seen carbs as cute as these! 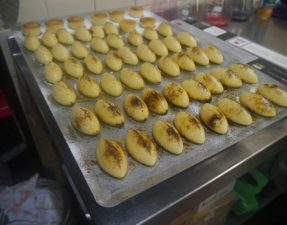 Mandazi is a fried piece of sweet bread (very similar to a doughnut) and is traditionally eaten with kuku paka (and other similar curries), or dipped in tea. It made a great and sweet contrast to the rich and spicy curry, and if you wanted something a little more savoury, the tiny naans made a good scooper. 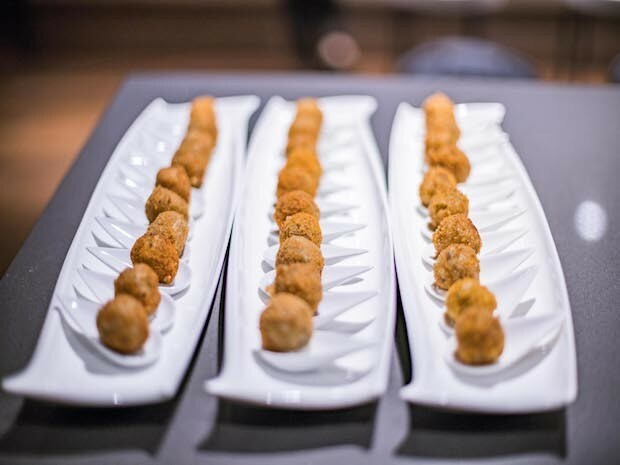 Cubes of flaky white fish that had been skewered and coated in a chilli sauce, and baked. Although the sauce was tasty, I felt it needed a little more of a kick to really stand out.The kale salad was deliciously crisp and sweet, and made a lovely accompaniment to the fish. 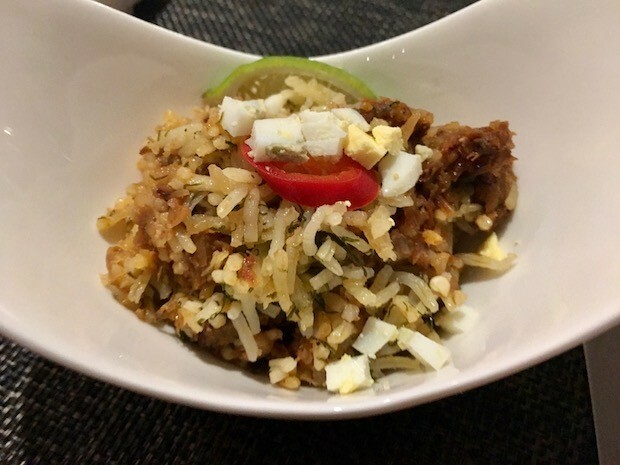 Similar to a biryani, this dish was made with layers of dill rice and lamb masala, and served with a crumble of boiled eggs. 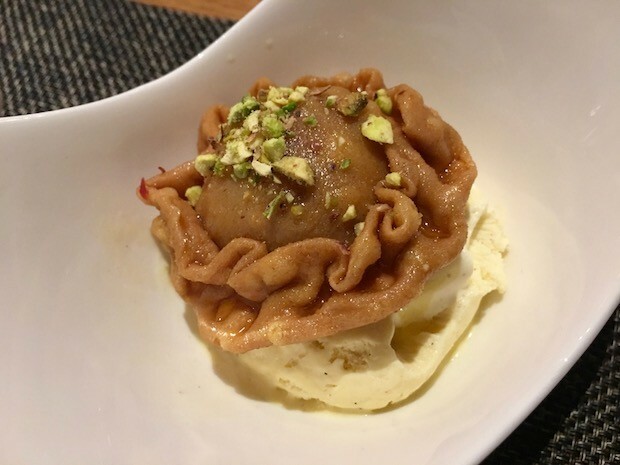 Sweet, golden pastry that had been filled with ricotta cheese, deep-fried, soaked in a saffron and cardamon sugar syrup, and finally topped with crushed pistachios. As if that wasn’t enough, it sat upon a small bed of vanilla ice-cream. This is an incredibly sweet and rich dessert, and is the perfect treat for all you dessert lovers out there. Naturally, I really enjoyed my dinner; I mean, this is the type of food I love to eat when I’m at Mum’s or at an Aunty’s house. 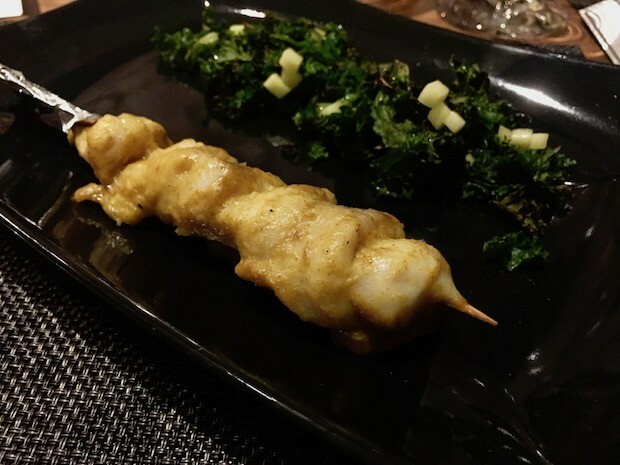 But Mzurikhana had taken all the traditional East African staples and added a modern twist such as smoking the chicken in the curry, or serving the fish skewers with a vibrant green kale salad (I don’t think Dad knows what kale even is!). 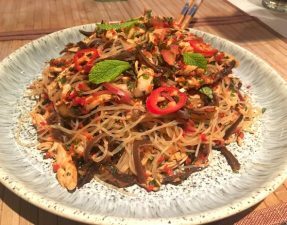 It was really great to see others around the table experiencing some of these dishes for the first time, and I think I even heard BW say that he prefers the East African version of kuku paka over his beloved Indian one! The total came to £40 each, including drinks, service, and the fantastic view. Sure, some could say that’s a little steep for dinner, but for a 7 course meal that requires several hours and days of shopping, prepping, cooking, and cleaning, and all for a good cause as well, I think this cost per head is more than justified. Don’t forget, this isn’t an hour-long meal at a restaurant, but a three hour dining experience. 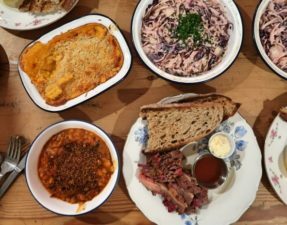 If you fancy having a traditional East African dinner and want to support the Syrian refugees, Mzurikhana will be holding another charity supper club early next year, so gather some friends together and book your tickets via their website. I love your blog because you love food just as much as I do and you focus mainly on the food. I was in London for Thanksgiving and visited one of your reviewed restaurants. It has never crossed my mind what your ethnicity is, nor your husbands for that matter, and it is sad that people feel so compelled to ask you this. I myself am an American Muslim and on the regular by complete strangers they ask where I’m from, as if Americans cannot be Muslim. My reply is Earth because in reality there are no boarders. In my opinion, it doesn’t matter where you or BW are from. I don’t care if you are ‘fat’. I like to read your reviews of these places that serve Halal food. Does BW stand for bread winner? Haha as relevant as that it is, unfortunately it does not stand for that!